Spring is here! And so is the weird weather that comes along in April. We go from gorgeously sunny, to cold and wet weather in the blink of an eye. This messes with meal planning and what I want to eat. Sunny days call for lighter foods, yet there are days when all I want is comfort. The days when I get soaked. Where the sun has disappeared and the sky is grey…. The days where I am as confused as the weather! And this is where this beautiful, bengali dal comes in. My friend Shami introduced me to this dish years ago, and I have been obsessed (OBSESSED) with it since. It is the perfect comfort food. A dish of contradictions. The soft turmeric lentils and the deep kick of the crispy fried chilly and onion. Golden. Buttery. Velvety. Spicy. Sweet. The added beauty of this dal, is that it is simple to make, ridiculously cheap and it makes use of ingredients you have lurking in your kitchen. It’s healthy, tastes incredible and leaves you full and satisfied. 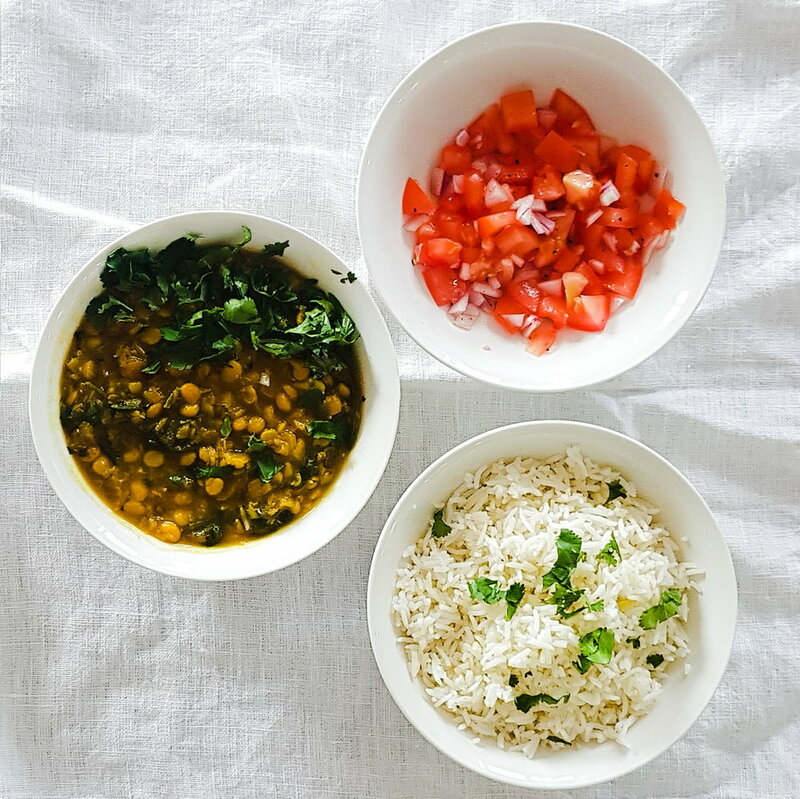 This dal is great by itself, but elevated to a feast with a bit of rice, a chapati and a tomato salad. My top tip when cooking this dish in not rush it. Simmer the lentils slowly and fry the spices on a low heat to prevent them burning. In a pot add the red lentils, chana dal, bay leave, turmeric, whole chilli, salt, pepper, half the onion and half of the garlic. Add a teaspoon of olive oil to this mix and then pour the water over. Simmer on a low heat for 35/40 minutes or until lentils are soft. In a frying pan add a teaspoon of oil and the rest of the onion. Fry on a low heat 10 minutes. Stir occasionally so it does not burn. Add garlic, chilli and chilli flakes and cook for another five minutes. When the lentils are cooked. Stir the spices and coriander through the mixture. Serve with rice, chapati and a salad. (A little note: To really enjoy this recipe: Sit down . Relax. Make a tea. Put on some music and let the warmth of this dish work its magic on you). *Check out this lovely pea soup if you want something plant based, that is not spicy. It takes 10 minutes to make and is the perfect midweek meal. *This spicy fish stew is super quick to make and tastes amazing with rice or on toast!